Instant downloads of all 946 LitChart PDFs (including The Maltese Falcon). Casper Gutman’s daughter. Drugged by her father, she uses a metal pin to make scratches in her stomach in order to stay awake long enough to tell Spade that Brigid O’Shaughnessy has been kidnapped. It is unclear whether Rhea was tricked by her father or if she was in on the scheme. The timeline below shows where the character Rhea Gutman appears in The Maltese Falcon. The colored dots and icons indicate which themes are associated with that appearance. Plaue, Ethan. "The Maltese Falcon Characters: Rhea Gutman." LitCharts. LitCharts LLC, 17 Jun 2015. Web. 25 Apr 2019. Plaue, Ethan. "The Maltese Falcon Characters: Rhea Gutman." LitCharts LLC, June 17, 2015. 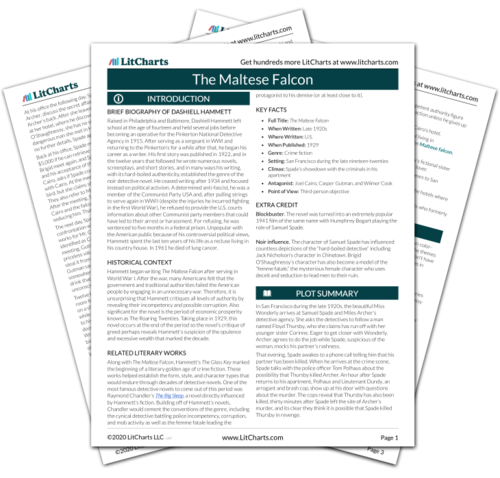 Retrieved April 25, 2019. https://www.litcharts.com/lit/the-maltese-falcon/characters/rhea-gutman.